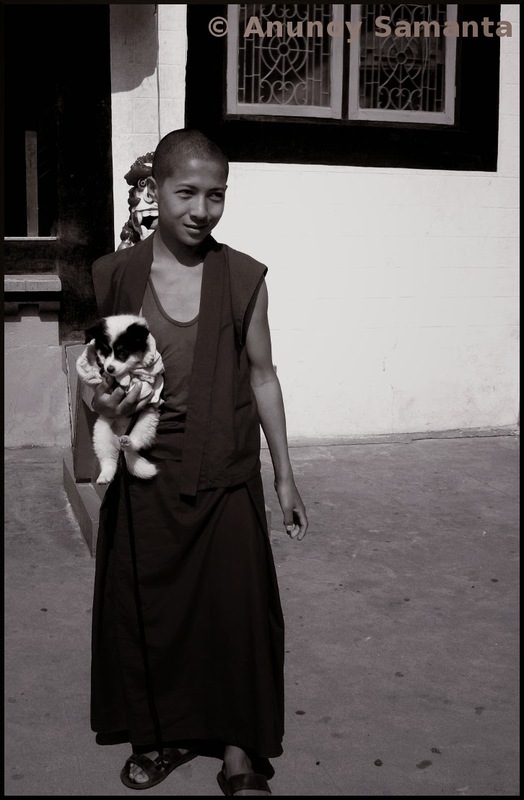 I met this young monk in a Tibetan monastery at Pokhara. Beside being a graceful boy he turned out to be a dog lover too and his pup was kinda cute. Being a part of the Sangha,right from this age he lives on mendicancy, ideally eating once a day and keeping just five things- the traditional robe, a razor, a needle, an alms bowl and a water strainer as his personal belongings! Perhaps he's a sramanera as of now and by twenty years of biological age probably he'll ordain as a bhikkhu (Buddhist monk). It's never easy to lead such a life... don't believe me? Well, try spending a day without your smartphone and you'll realize it yourself. When i read that he can keep only 5 things and thought to myself which would be my list of 5 things, i ended up as 5 is too less. I agree its a difficult life or perhaps we have widened our comfort zone too much. Needless to say its a wonderful click Anunoy. Such calm and content eyes.....rare in a child of today!